Deb's Cup of Tea: Yum! 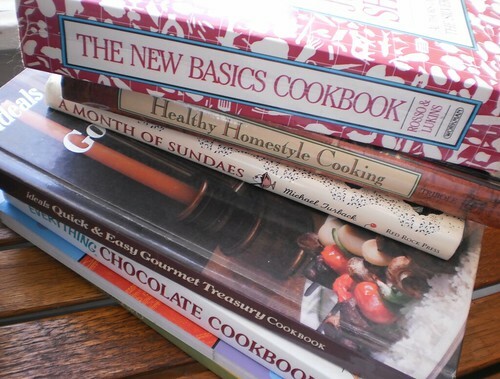 I like cookbooks. I think they are a fascinating read. In the living room, on one bookshelf, two shelves are devoted just to cookbooks. Plus, I had a stack on top of the bookshelf. I decided, last year, to go through the stack on the top, look through each one, and decide if I really wanted to keep it. Did it have things I would make or did I buy it just because it was interesting? The interesting but unusable ones would be given away. How is it working out? So far, I haven't found one I couldn't make something out of with an eye towards more cooking from that book. Some weekend mornings, I can get up and get a decent breakfast assembled that's not reheated frozen muffins or cereal. Today was one of those mornings. The selected cookbook was this one. 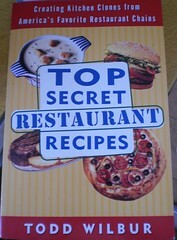 There are some very interesting recipes in this book. I selected IHOP's banana pancakes. 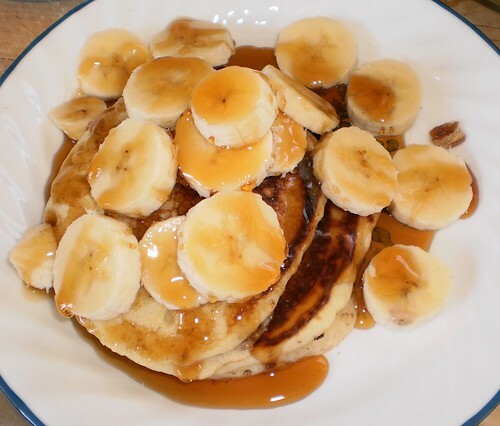 The recipe starts by making banana-flavored syrup. I opted not to make that. I won't have a use for it except for these pancakes. The batter came out quite light and smooth. 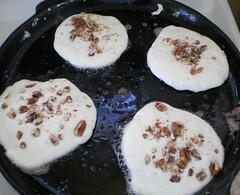 One of the things I kept forgetting to do was sprinkle the chopped pecans over the top after pouring 1/4th cup of batter on the griddle. 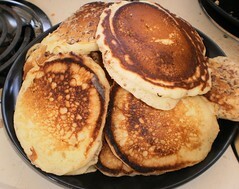 I would say half of the pancakes the recipe made, and it makes a lot, don't have pecans in them. 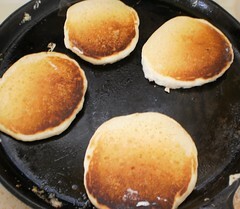 They cooked up nicely although I have never seemed to be able to master the art of completely even pancake cookery. I don't know if it's the way the burner lies on the stove or my skillet isn't flat to distribute the heat evenly. Whatever. One side gets done first while the other side is barely cooked. Still, when the sliced banana was added to cover the pancake and the whole thing drizzled with maple syrup, that's a breakfast. No, whipped cream on this would be overkill and would ruin the flavors. The best part is the stack that I now have to freeze for almost instant breakfasts in the weeks ahead.